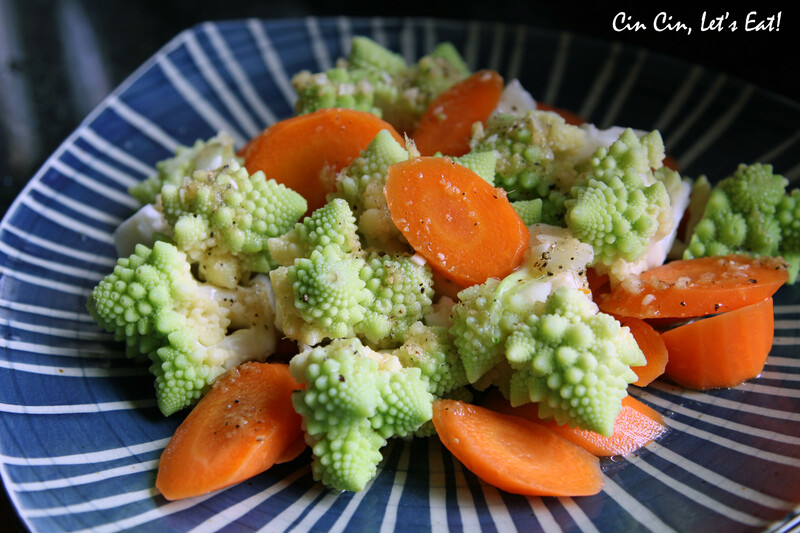 Romanesco Carrot Salad [recipe] – Cin Cin, Let's Eat! Romanesco has been on the scene for a while and I have ordered it a few times in restaurants, but I never cooked one until one arrived in my monthly produce box today. This month’s box also comes with a couple romanesco recipes, I blanched the romanesco florets to make this delicious crunchy salad. The ginger really elevated the flavors of this dish. Such a cool vegetable! The spirals and the peaks reminded me of something out of a mathematics textbook. Prepare the dressing in a non-reactive bowl by whisking the ingredients together. Taste and adjust seasoning if necessary. Set aside. 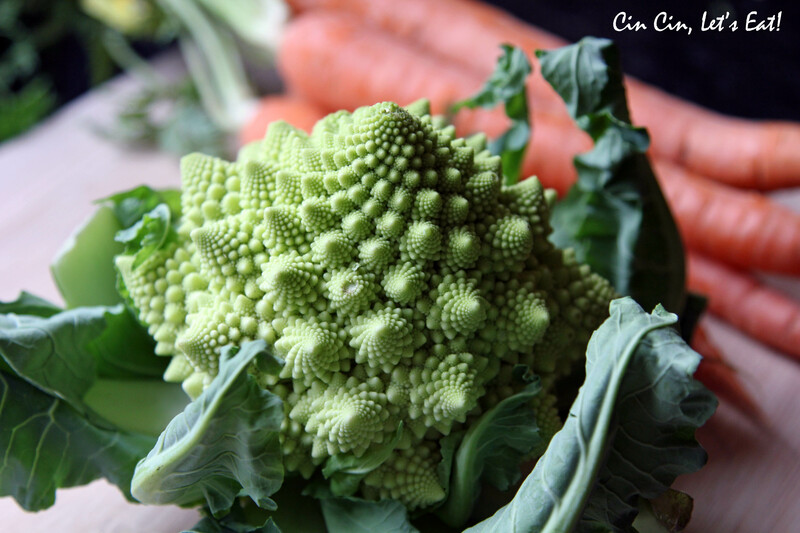 Lightly blanch the romanesco in a large pot of boiling water. Immediately plunge into cold water to stop the cooking process. Drain well. 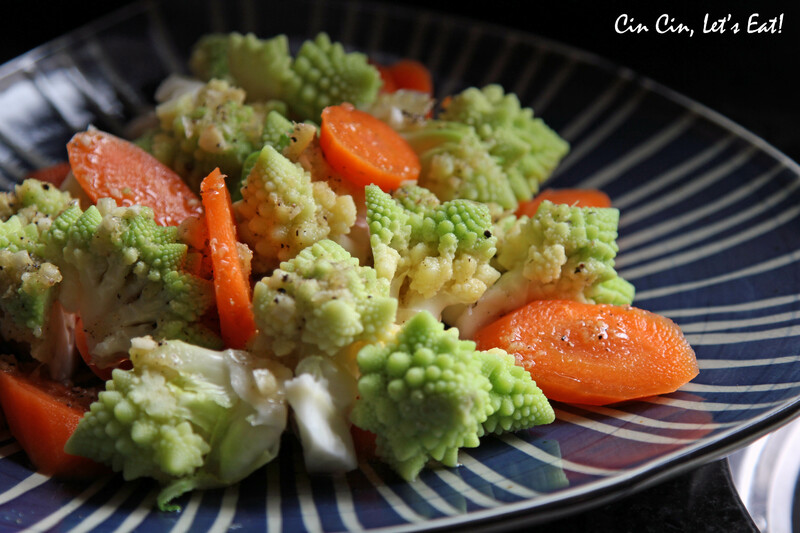 Transfer the blanched romanesco, carrots (and chilis if using) to a salad bowl and pour the salad dressing over them. Cover. Best if salad is prepared several hours in advance to allow the vegetables to marinate. Stir in the cilantro leaves just before serving. Serves 6. I blanched the carrots with the florets as I am slightly allergic to raw carrots (causes itchy gum). I blanched them for a little over a minute, both vegetables maintained the crunch yet were slightly cooked through. I used one small head of romanesco and two large carrots. This sounds great! I’m always buying fun veggies at the store and then drawing a total blank when it comes to preparing them. 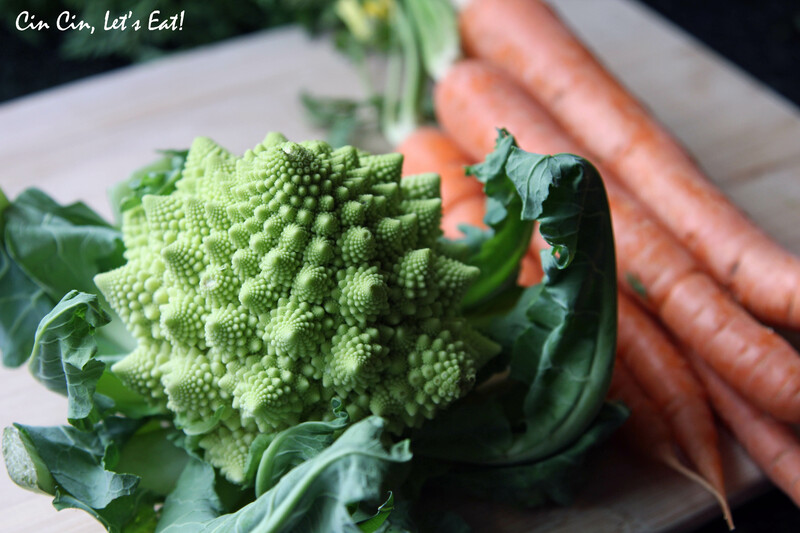 I’m going to be on the lookout for romanesco next time so I can give this a try.